Golden Plains across the series. Golden Plains (野原, Fields) is a stage in Super Smash Bros. for Nintendo 3DS and Super Smash Bros. Ultimate. 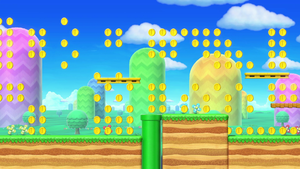 The stage is based on New Super Mario Bros. 2 and features many coins for fighters to collect. In this stage, several elements from the New Super Mario Bros. series appear, including thin platforms, scale-like platforms which will tilt (and potentially fall) when stood on, flat-top hills to stand on, and bottomless pits. Throughout the stage there are many coins for fighters to collect, and by collecting 100 of these, a fighter temporarily becomes a gold version of themselves called a "Gold Fighter". Gold Fighters have stronger attacks and super armor. They can still be grabbed and thrown, however. In for 3DS, the number of coins the player has is displayed in the top-left corner of the screen, with each human player only able see their own count and not their opponents'. In Ultimate, each fighter's coin count is shown below their damage meter. Blue P Switches sometimes appear. When pressed, they make several Blue Coins appear. Occasionally, Red Rings will appear. When jumped through, 8 Red Coins will appear. These Red Coins are worth 5 coins each. Sometimes, an arrow signpost will appear and the screen will scroll in the direction the arrow points, bringing the fighters to a new area of the stage. In Super Smash Bros. for Nintendo 3DS, the Ω form only consists of a single platform with a yellow pipe on each side that extend below the blast line. Coins never appear and the screen never scrolls. In Super Smash Bros. Ultimate, the Ω form consists of a single platform floating far above that is made of soil with grass on top, and the Battlefield form is the same platform but with three orange soft platforms above it. The Ω form and Battlefield form are also the same size and shape as Final Destination and Battlefield respectively. World 1-1 as it appears in New Super Mario Bros. 2. Golden Plains is based on World 1 in New Super Mario Bros. 2. Collecting coins was a major objective of that game (in fact, the game challenges the player to collect 1,000,000 coins). This translates into Golden Plains's main gimmick of collecting coins. In most installments of the Super Mario Bros. series, collecting 100 coins results in earning an extra life. New Super Mario Bros. 2 introduced a power-up called the Gold Flower, transforming Mario into Gold Mario. Gold Mario could throw golden fireballs that turned several objects, including brick blocks, into coins. The game also features gold forms of many enemies, caused by Mario jumping through a Gold Ring, which primarily causes them to create coins as part of their movements or attacks. The middle area of the stage appears to be based off of World 1-1 of New Super Mario Bros. 2, the left section resembling World 1-3, and the right portion appears to be based off of World 1-4. The coin counter font is the font used for large text in Mario games since Super Mario 3D Land. Golden Plains in Super Smash Bros. for Nintendo 3DS. Samus as a Gold Fighter. Samus, Luigi and Little Mac fighting. Lucas advancing towards Gray Fox on the stage in Ultimate. While Luigi turns silver when he collects the Gold Flower in New Super Mario Bros. 2, he turns golden like every other character in Super Smash Bros. for Nintendo 3DS. After collecting 100 coins, the "power-up" sound effect chimes instead of the "1-Up" chime, indicating that the character has turned into a Gold Fighter. There is a glitch on this stage when PK Starstorm hits a Gold Fighter, in which their outline from being gold remains after returning to normal for a short time. The coins in this stage are the same size compared to Pikmin as the Mushroom Kingdom coins portrayed in the Pikmin Short Movie Occupational Hazards. When in a multi-man battle in Classic Mode or All-Star Mode, the bar with number of characters left to fight in the battle is pushed down below the coin counter. If Bayonetta uses Infernal Climax, any golden characters return to normal. Also, the coins become intangible for everybody. When Pac-Man uses his Final Smash, the coins will stop rotating, but players (except Pac-Man) can still collect them (unless Pac-Man bites them and they turn into eyes, in which case they'll go through them). Any chomped characters that are Gold Fighters will return to normal. In demo sequences, the coin counter shows how many coins the first CPU has collected. This page was last edited on April 17, 2019, at 02:14.